Oct. 2, 2016 - Testimony, a young bride from Nigeria, dances with her friends and relatives during her wedding reception. Testimony and Mike, both from Nigeria are members of the Apostolic Church, God's Mercy Family, in Torre Angela, a working class neighborhood in the far eastern suburbs of Rome. 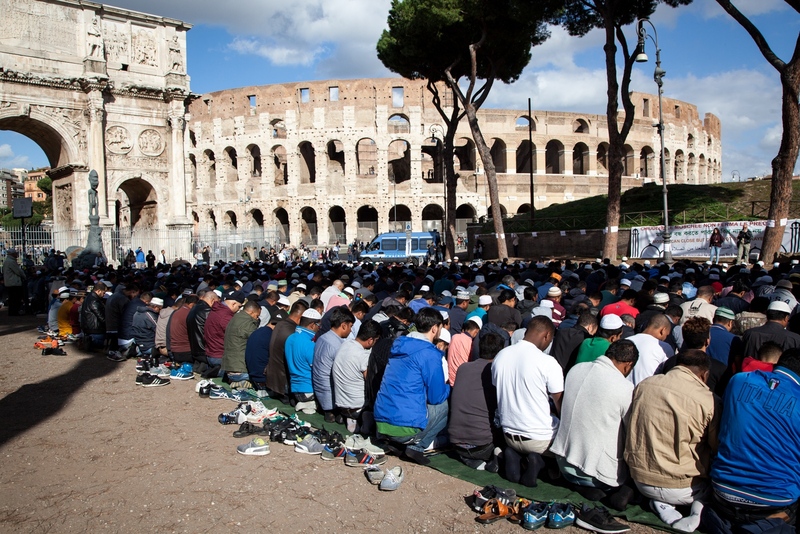 Oct. 21, 2016 - Hundreds of Muslims who lives in Rome are gathered for the Friday communal prayer in front of the Colosseum. This particular gathering was organized by some Imams to protest against the closure of a few mosque in the southeastern part of the city. Stefano is blessing the food that the faithfuls brought. Sept. 30, 2016 - Kids play after school in Largo Preneste on a Friday afternoon. 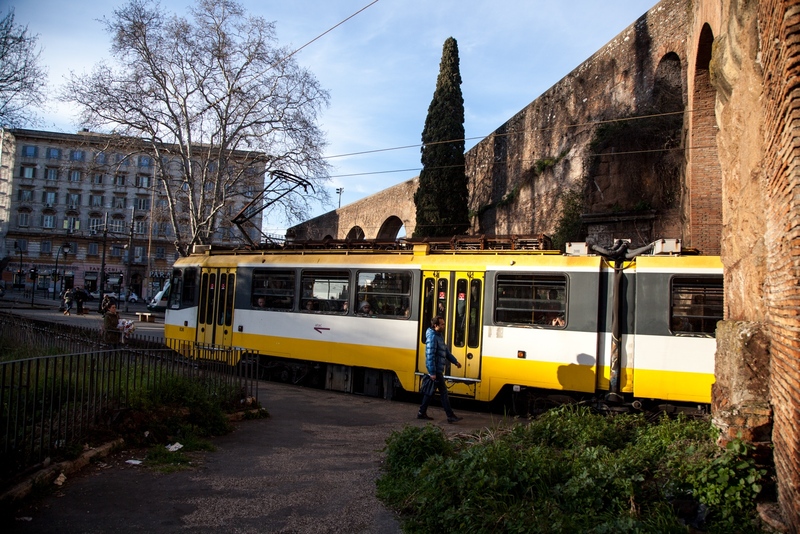 We are in the southeastern neighborhood of Torpignattara, one of the most multicultural areas of Rome. 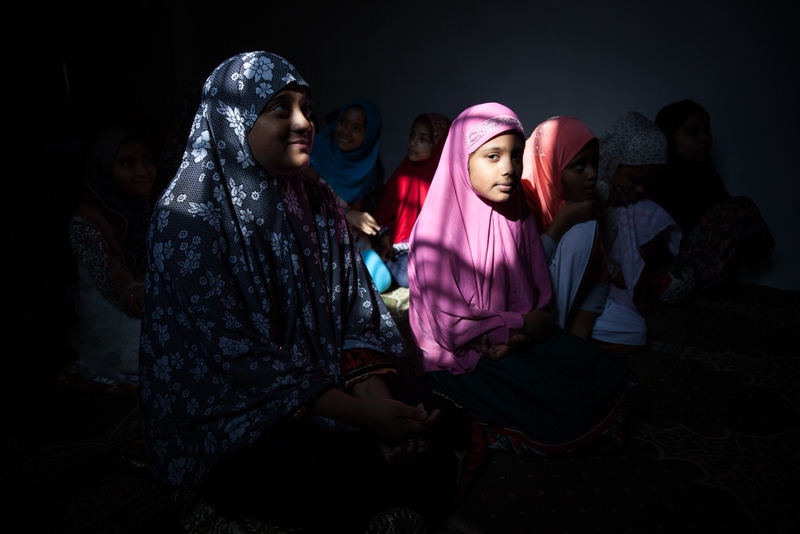 July 6, 2016 - Members of the Bangladeshi community of Rome perform the Eid al-Fitr prayer, that marks the end of Ramadan, in a public square in Torpignattara, a working class neighborhood in the southeastern suburbs of Rome. 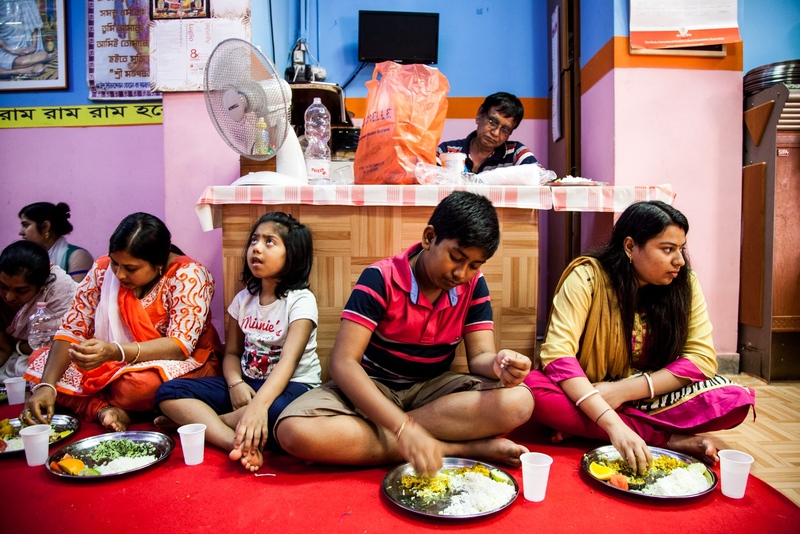 Aug. 26, 2016 - On Krishna Janmashtami, the annual celebration for the birthday of the deity Krishna, some people eat their lunch in the "Om Hindu Mandir" temple of Torpignattara, a working class neighborhood in the southeastern suburbs of Rome. July 30, 2017 - A little girl plays with a balloon before the Maghrib prayer begins. The Bangladeshi community of southern Rome, rented a big space to vote for new representatives and this is the area designated for the prayer. Apr. 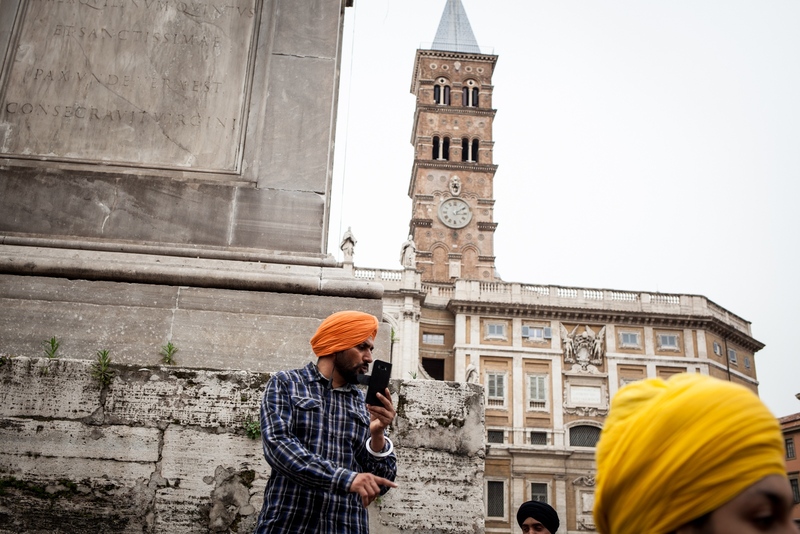 15, 2018 - Every year Piazza Vittorio hosts the Vaisakhi Nagar Kirtan, the most important religious event for the Siks. Hundreds of members of the community from all over Italy gather in the square for prayers, sacred chants and a communal meal. 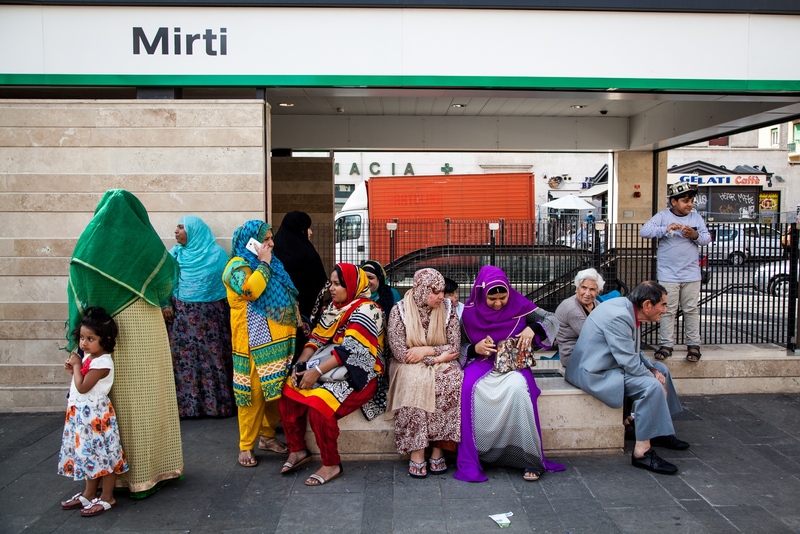 Sept. 30, 2016 - Muslim women wait for the beginning of the Friday communal prayer in Largo Preneste, a square in the southeastern neighborhood of Torpignattara. 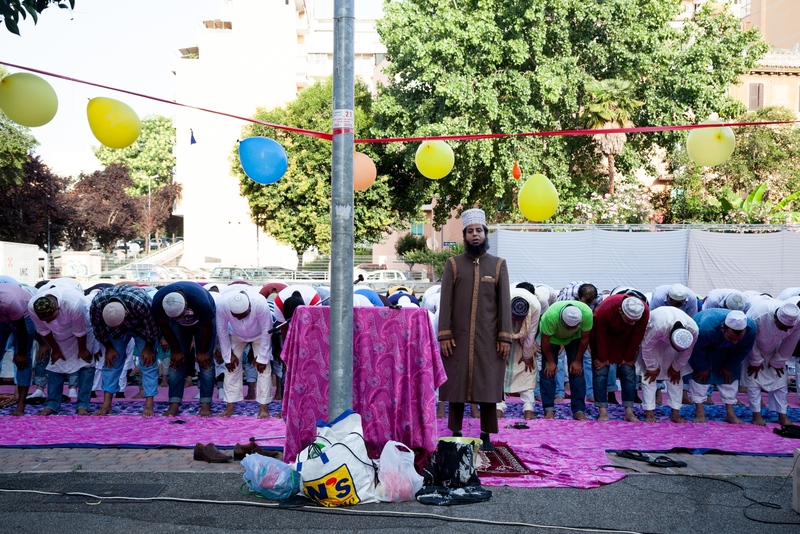 In the past few months the Muslim community of southern Rome, has organized public prayers on Friday to protest against the closure of a few mosque in different neighborhoods. 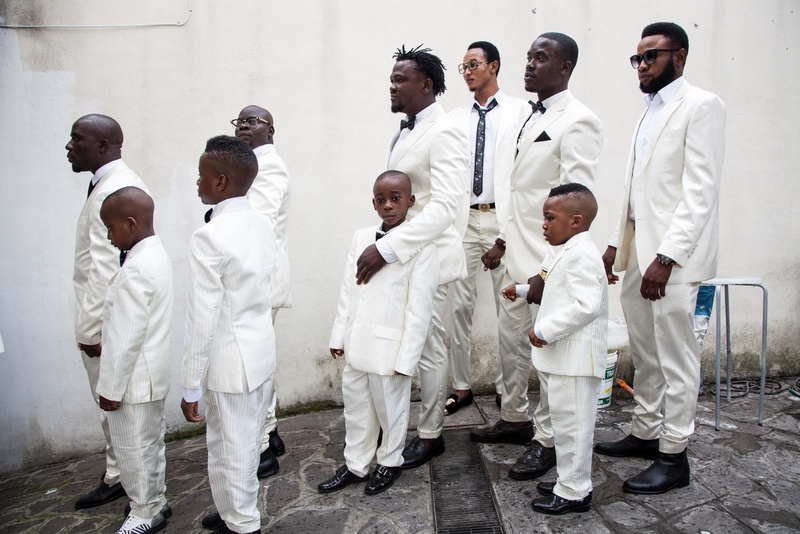 Oct. 2, 2016 - The men of the Nigerian Apostolic Church, God's Mercy Family in Torre Angela, a working class neighborhood in the far eastern suburbs of Rome, wait for the arrival of Testimony and Mike, a young couple from Nigeria, who is about to get married. Dec. 25, 2016 - Little girls listen to the teacher's instructions while waiting to perform during the Christmas show at the Chinese Evangelical Church n the multicultural Esquilino neighborhood in downtown Rome. Apr. 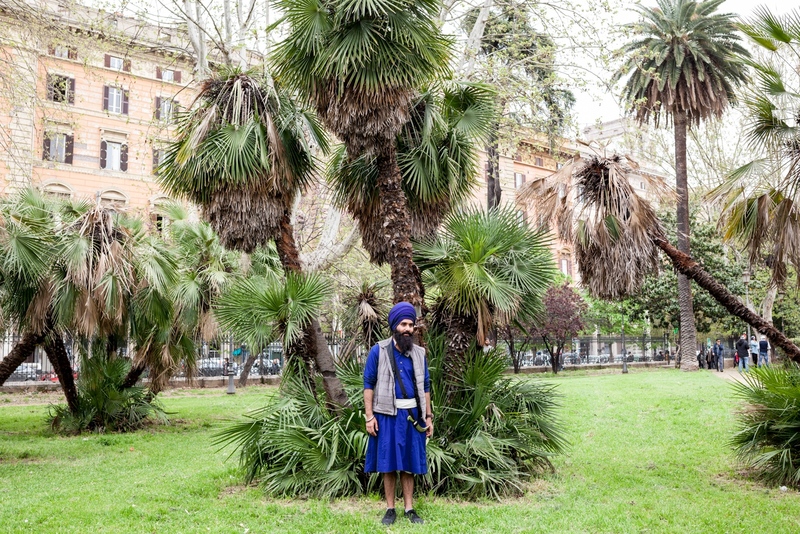 15, 2018 - Every year Piazza Vittorio hosts the Vaisakhi Nagar Kirtan, the most important religious event for the Siks. Hundreds of people from all over Italy gather in the square for prayers and a communal meal. Apr. 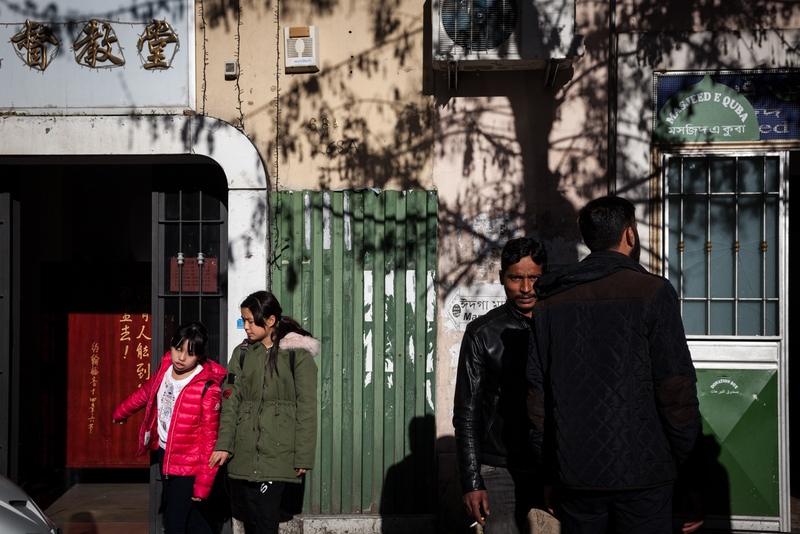 1, 2018 - A Chinese evangelical church and a mosque keep via della Marranella busy on Sunday afternoons. 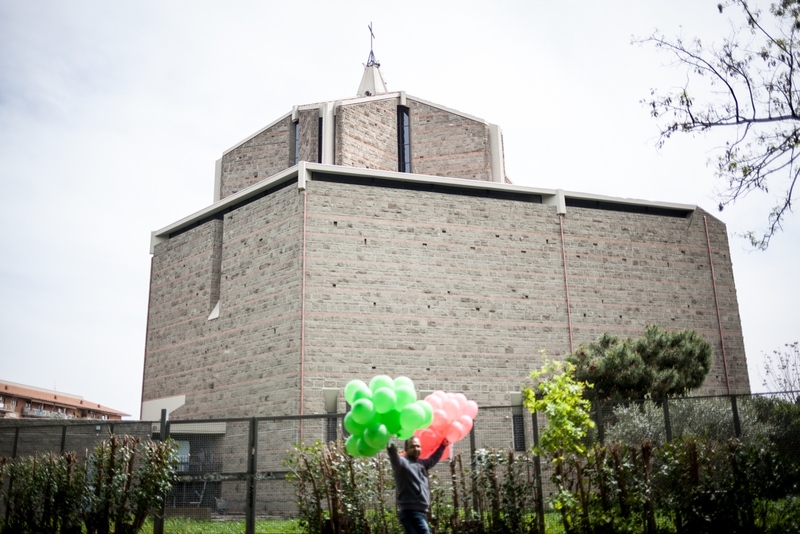 We are in the multicultural southeastern neighborhood of Torpignattara where the migrations of the last 30 years have brought many different cultures and religions together. Apr. 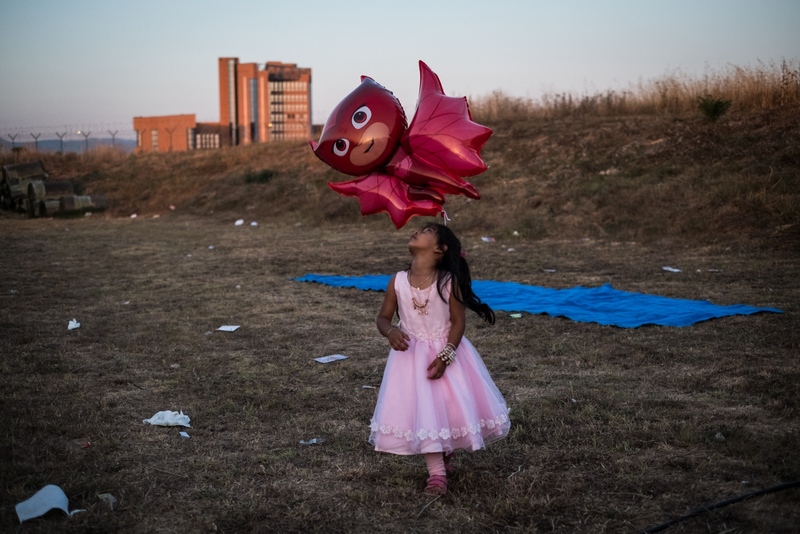 14, 2018 -A man brings balloons for the celebration of the Bangla New Year in a public park in southeastern Rome. 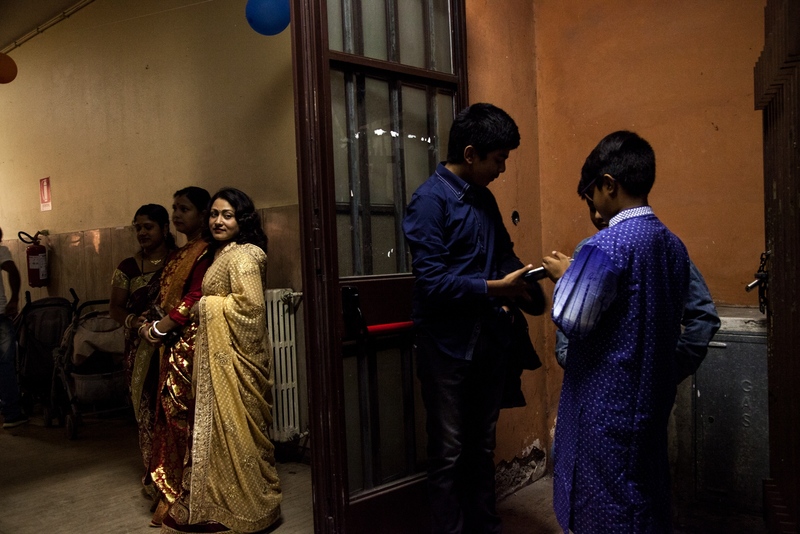 Hindus and muslims from Bangladesh gather every year in different areas of Rome to celebrate the event. 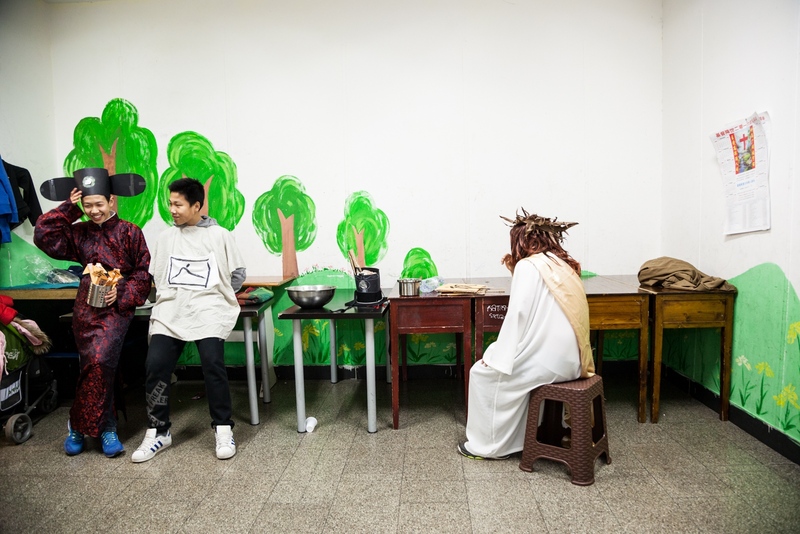 Dec. 25, 2016 - Boys waiting to perform during the Christmas show at the Chinese Evangelical Church n the multicultural Esquilino neighborhood in downtown Rome. outside the church before a wedding. 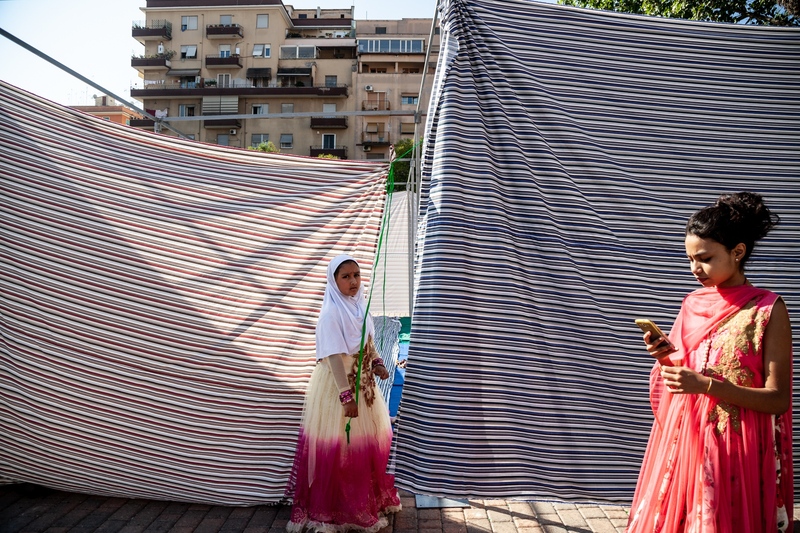 Sept. 12, 2016 - In the southeastern multicultural neighborhood of Torpignattarta, little girls play outside the women section built for the celebration of Eid al-Adha, also called the "Festival of Sacrifice". 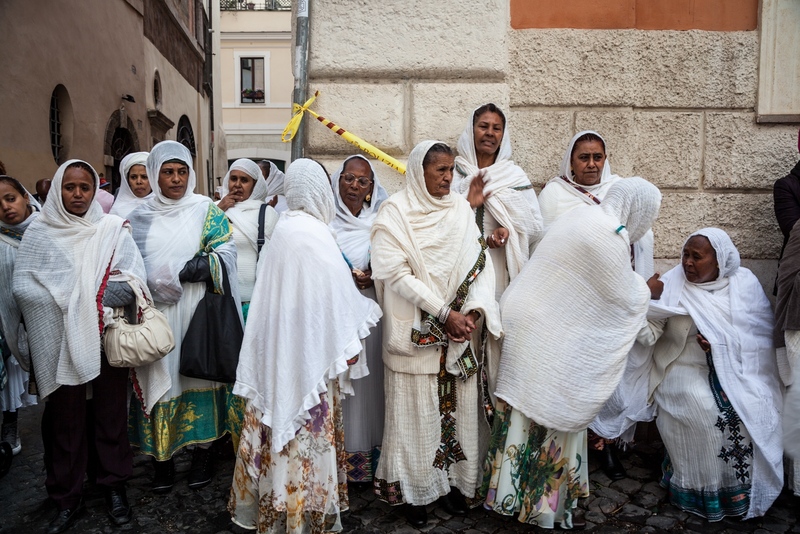 Nov. 23, 2014 - Members of the Eritrean Orthodox Tewahedo Church talk outside St. Michael's Church in downtown Rome, right around the corner from Campo de' Fiori, during the celebration for the patron saint of the community. 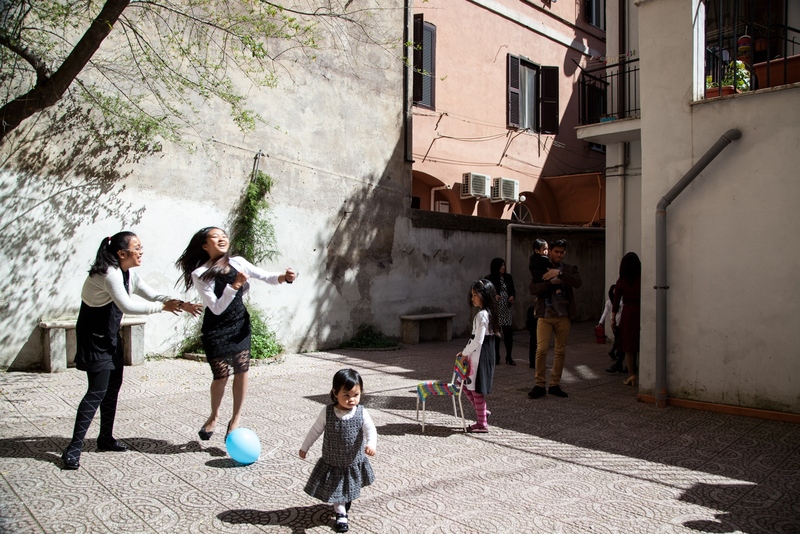 March 28, 2015 - Kids play in the back of the Filipino Adventist Church, in Rione Monti, downtown Rome. 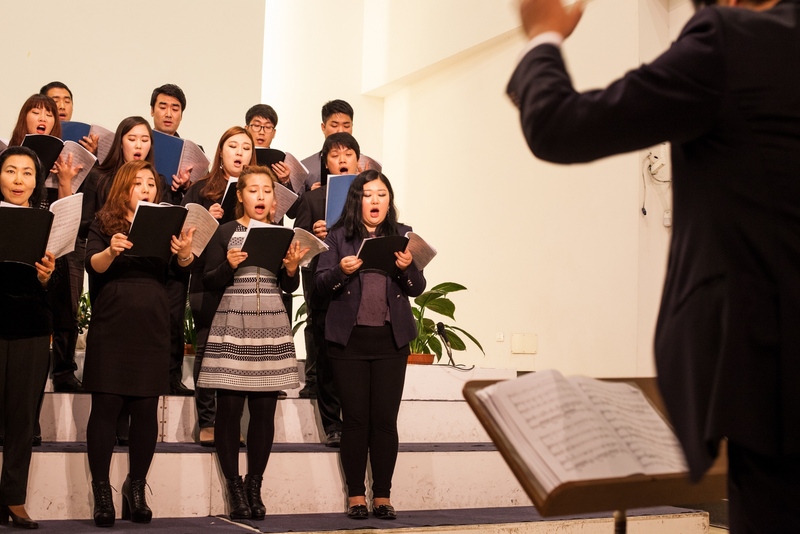 Nov. 16, 2014 - The choir of the Corean Evangelical Church in Quadraro, a working class neighborhood in southeast Rome. Nov. 19, 2016 - Arbaeen celebration a the Islamic Centre Imam Mahdi, near Furio Camillo, a neighborhood in the southern part of Rome. This is the only Shia mosque in the city. July 07, 2017 - After the Friday prayer, men leave a small Mosque next to a Catholic Church (Chiesa di Sant'Eusebio) in Piazza Vittorio, one of the most multicultural areas of Rome. 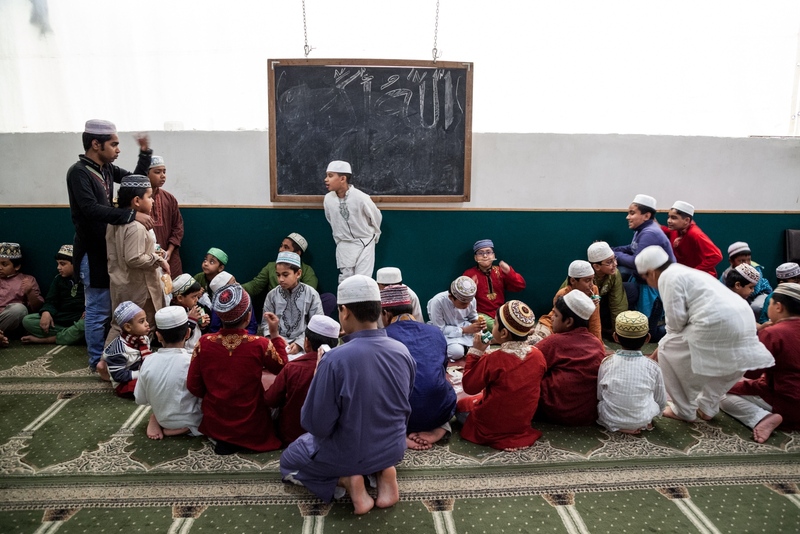 Oct. 18, 2014 - Kids play during a break from religious studies in the madrasa inside the Mosque of Via Gabrio Serbelloni. 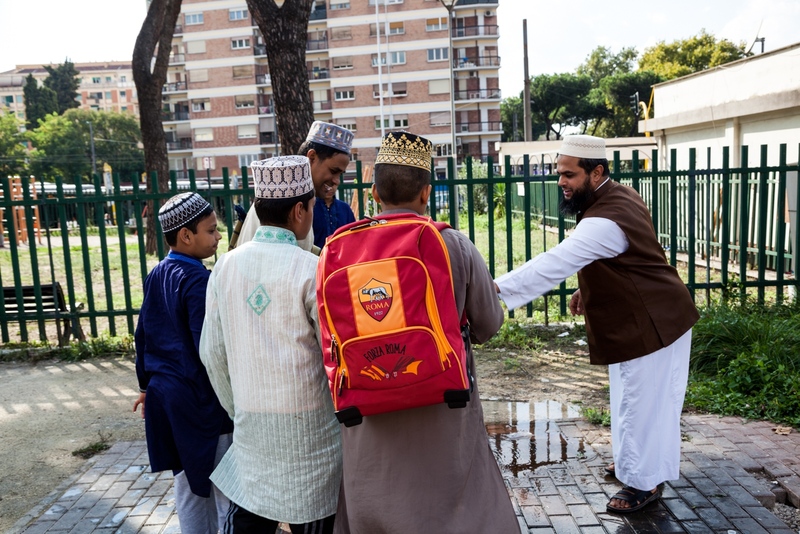 Every Saturday the members of the Muslim community who live and work in Tor Pignattara, a working class neighborhood in southeast Rome, send their kids to the Mosque to study the Quran. 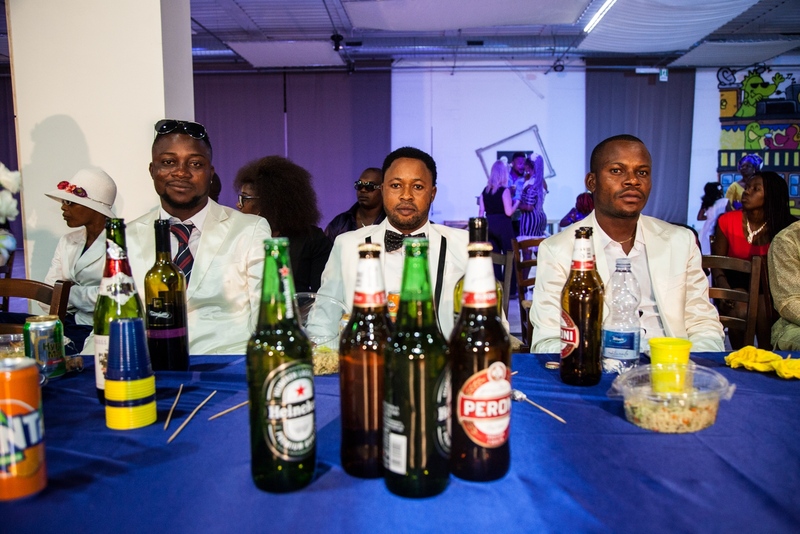 Oct. 2, 2016 - Guests of Testimony and Mike, a young couple from Nigeria, hang out at the wedding reception in a ballroom in Finocchio, a neighborhood just outside Rome. 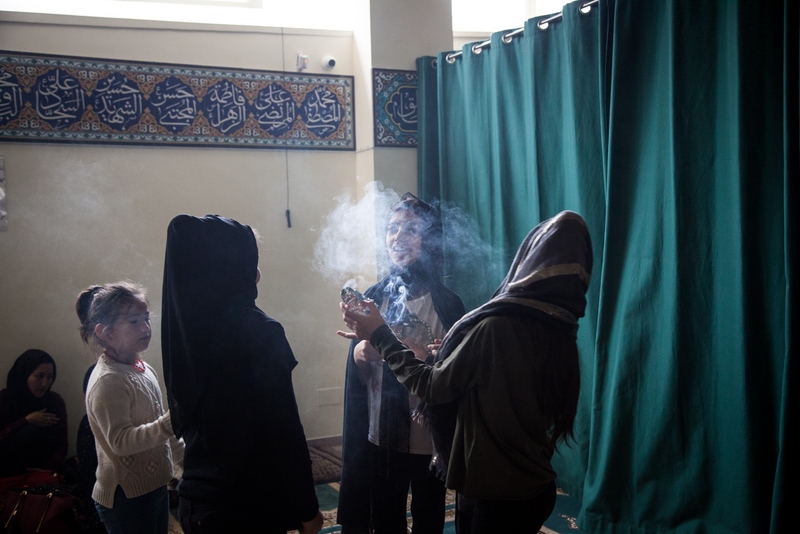 Oct, 1 - 2017 - Girls play with incense during the celebration for the day of Ashura at the Islamic Centre Imama Mahdi, in the southern area of Rome. The centre is the only Shia mosque in Rome. 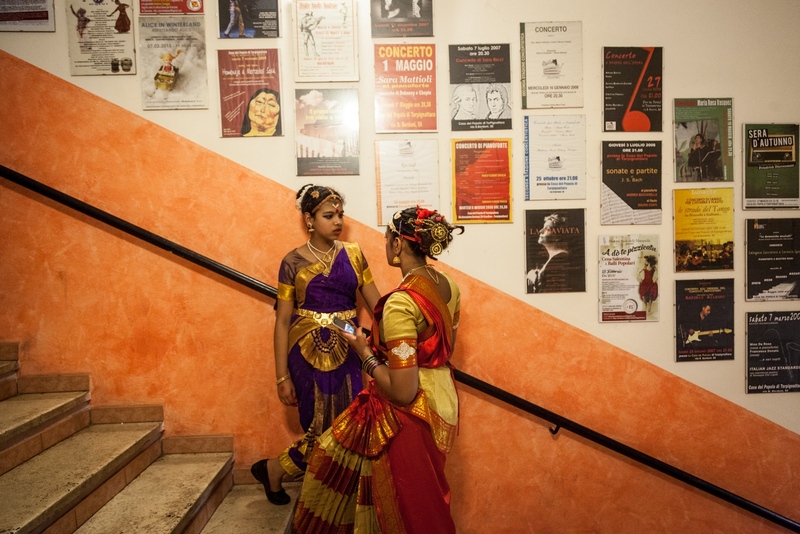 Oct. 8, 2016 - Two girls talk outside the theater during Durga Puja celebration that took place in a community center in Torpignattara, a working class neighborhood in southeastern Rome, where many different immigrant communities live and work. 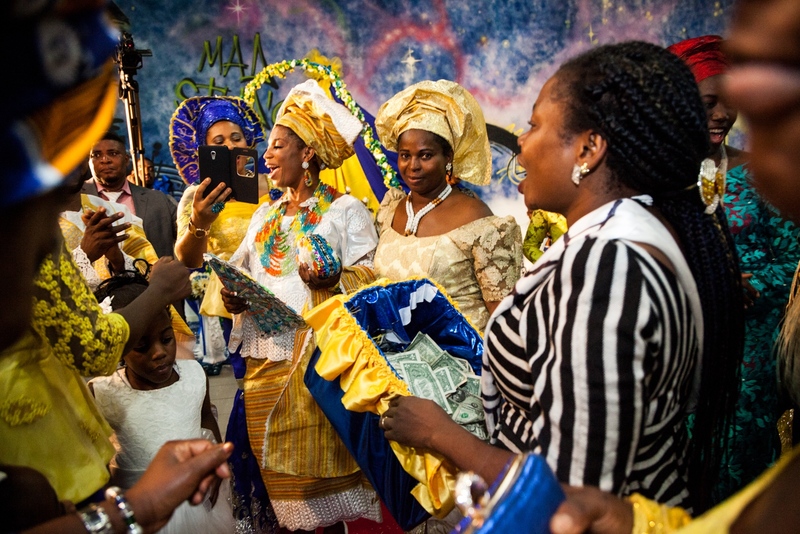 Oct. 30, 2016 - Harvest Day celebrations at the Nigerian Apostolic Church, God's Mercy Family, in Torre Angela, a working class neighborhood in the far eastern suburbs of Rome. Apr. 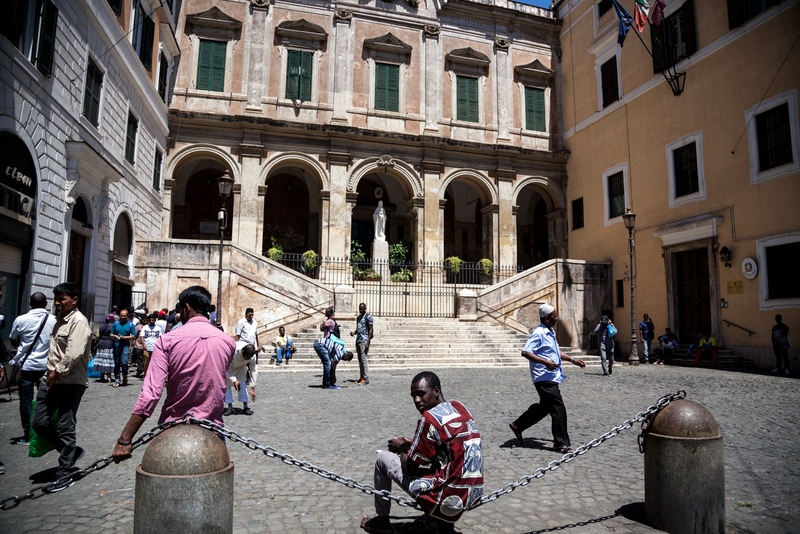 15, 2018 - Men wait for the procession to arrive in Piazza di Santa Maria Maggiore, in the multicultural neighborhood Esquilino. Every year the area hosts the Vaisakhi Nagar Kirtan, the most important religious event for the Sikhs. Hundreds of people from all over Italy gather in the square for prayers, sacred chants and a communal meal. Apr. 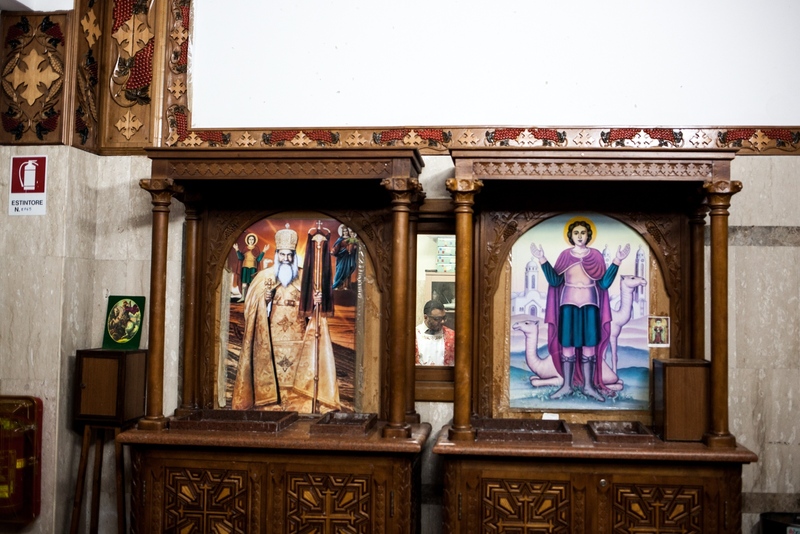 7, 2018 - Easter celebration at the Egyptian Coptic Church of San Giorgio in the northeastern area of Monti Tiburtini. 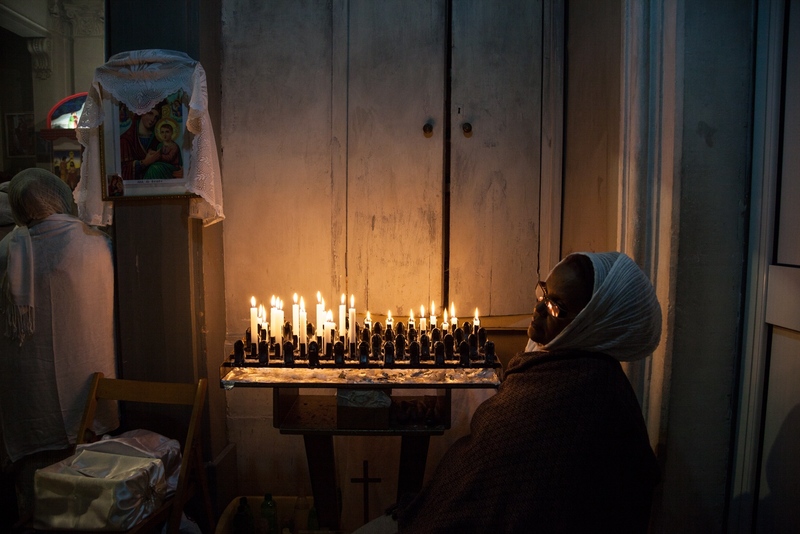 Jan. 6, 2015 - Inside the Eritrean Orthodox Tewahdo Church in Piazza San Salvatore in Campo, downtown Rome, a woman takes part to the celebration for Orthodox Christmas Day. 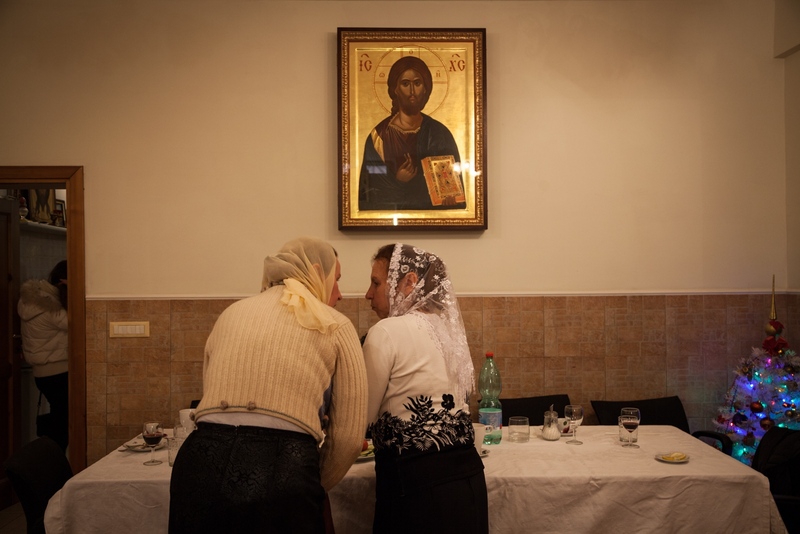 July 29, 2016 - Friday communal prayer in the women section of a mosque in Torpignattara, a working class neighborhood in the southeastern suburbs of Rome. 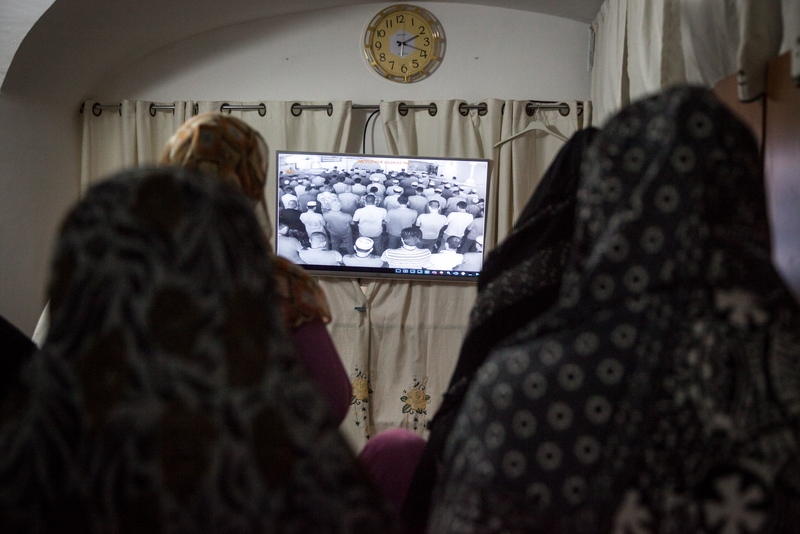 On weekdays , the women usually pray at home, while they take care of the house and the kids, but on Fridays you can find more women at the mosque. 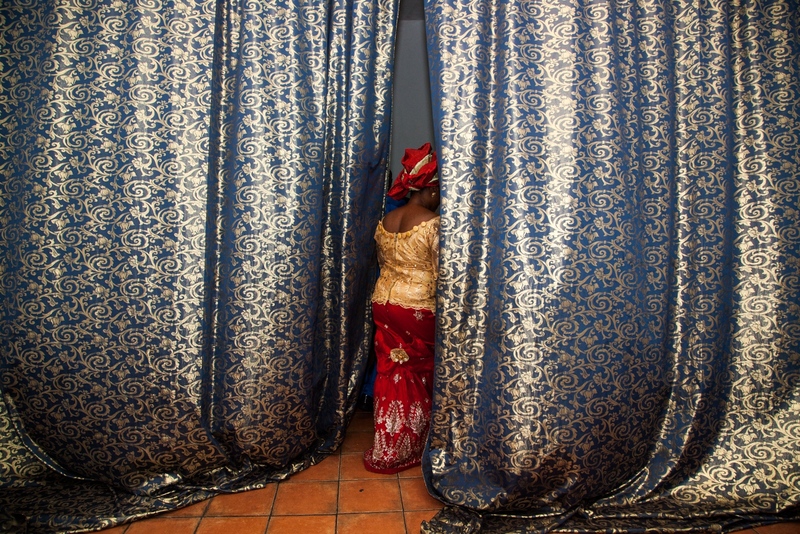 Sept. 29, 2017 - Durga Puja celebration in a space rented by the Hindu community of the multicultural southeastern neighborhood of Torpignattara. Oct. 18, 2015 - A little student of a madrasa in Torpignattara, a working class neighborhood in southeast Rome. Every Saturday, the members of the Muslim community who live and work in the neighborhood, send their kids to the mosque to study the Quran. I received a Catholic education, not because my parents were particularly religious, but because the church was seen as the center of the community, a safe place where kids could make friends. In Rome, the Catholic Church has been predominant for centuries, leaving other religious communities as afterthoughts. After living in New York City for a few years, I moved back to Rome and noticed a major change. The constant flow of immigrants in the recent past has produced a sea-change in the social landscape. Other religious groups are now thriving around the home of the Catholic Church. The first waves of immigrants settled, started families, and created communities primarily in the suburbs. They brought their religions with them, and now these enclaves have become unofficial welcome centers for thousands of new arrivals, helping them quickly form social bonds and navigate their new home. 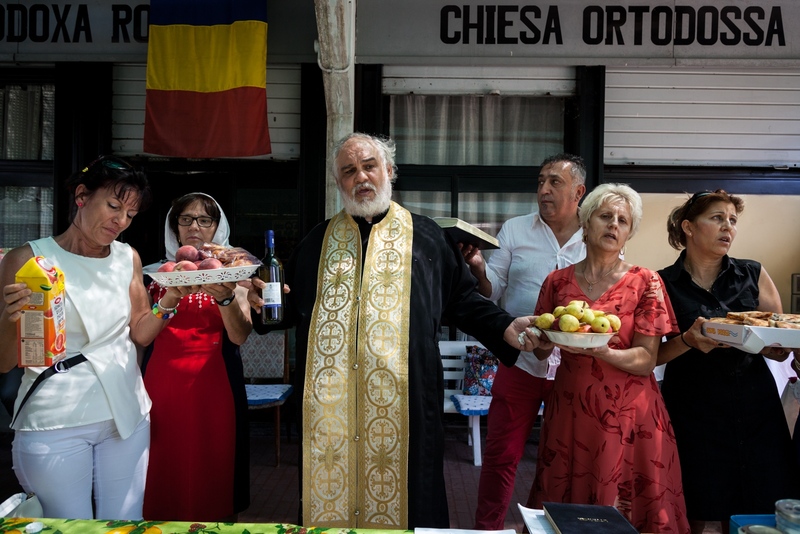 Similarly to the way the Catholic Church has functioned for Italians in Rome for centuries, a melange of religions is now the glue that holds multiple immigrant communities together -- all in the shadow of the Vatican. 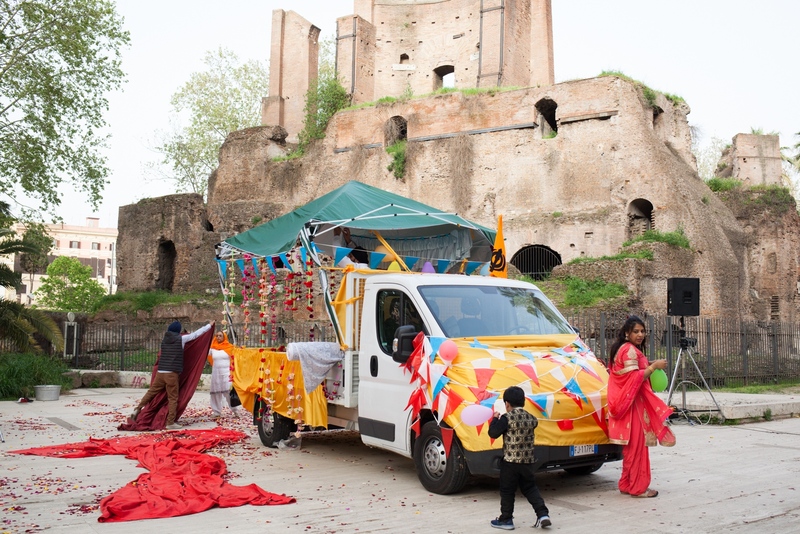 These past years I have been working on this project with the final goal to create a visual map of the new multicultural Rome, emanating from the places of worship in a city where religion plays such a crucial role. 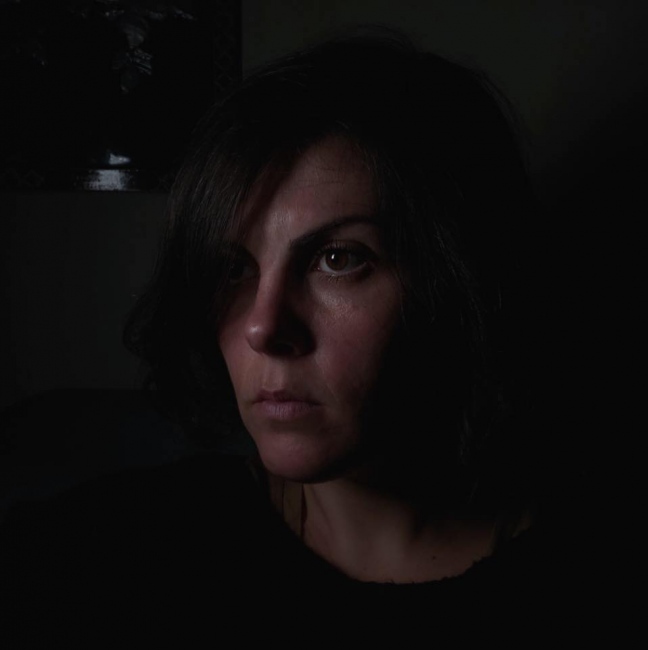 By Martina Albertazzi — Studies are painting a bleak picture of an American society that is increasingly isolated and unhappy. Different surveys show how the number of..
By Martina Albertazzi — A look into the acrobatic world of a group of Chinese American teenagers passionate about the ancient lion and dragon dance performing art. The..
By Martina Albertazzi — It’s an early afternoon in central Beijing where the first snow hasn’t completely melted and a cold, sharp wind is blowing in from the north. 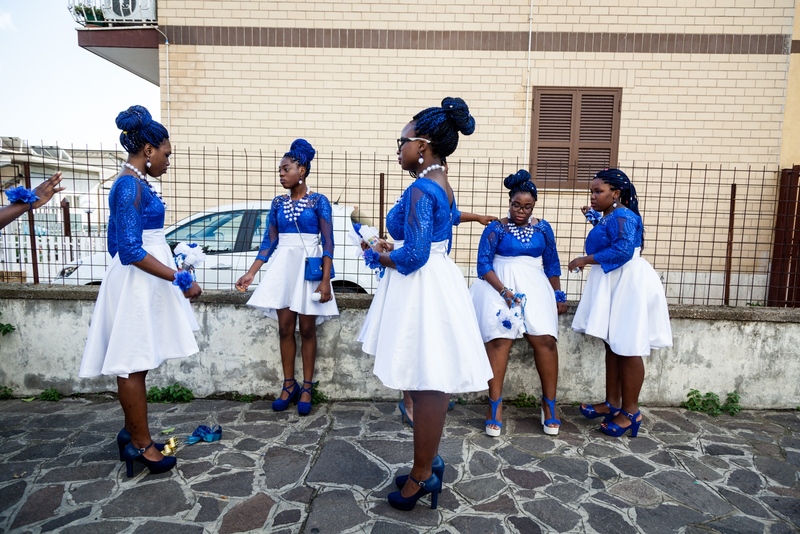 A..
By Martina Albertazzi — The Gypsy Circus On March 2014 I attended a four-day workshop about visual storytelling in Paris and I tried to document the life..